Western blot analysis of human A431 fibroblast cell lysate, probed with Erk1/2 Polyclonal Antibody. Immunohistochemistry analysis: Human placenta tissue stained with Erk1/2 Polyclonal Antibody at 10µg/ml. Earn up to 549 reward points for this purchase! Extracellular signal-regulated protein kinases 1 and 2 (Erk1/2) belong to the mitogen-activated protein kinase (MAPK) super family associated with cell proliferation and apoptosis. Erk1/2 may be activated by a variety of extracellular stimuli including mitogen, growth factors, and cytokines. After Erks have been activated, they will proceed to phosphorylate several other downstream molecules that are involved in a range of cell activities. The MAPK signaling pathway is a frequent target for oncology-related drug development. Liquid. In PBS containing 50% glycerol and 0.09% sodium azide. Synthetic peptide corresponding to a portion of rat Erk1. The sequence is completely conserved in hamster. Fig. 1. 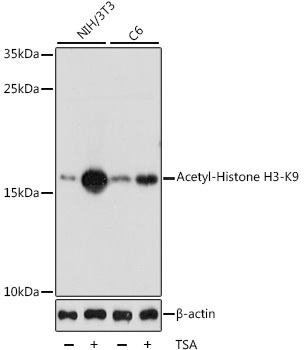 Western blot analysis of human A431 fibroblast cell lysate, probed with Erk1/2 Polyclonal Antibody. Fig. 2. Immunohistochemistry analysis: Human placenta tissue stained with Erk1/2 Polyclonal Antibody at 10µg/ml.